Shelf Inflicted: Villain or Unfairly Vilified? "Another focus of the article was on Madame Nhu--a woman who seemed to be a fascinating character to the journalists of the time as I found several references to her in more than one Newsweek article, and as many pictures of her in fashionable dress. It's reported that Diem is little more than the puppet of Madame Nhu and her husband, Ngo Dinh Nhu. 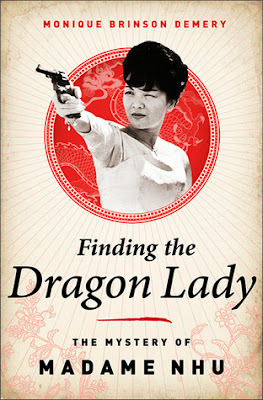 She's portrayed as an almost comic book like villain--an Asian femme fatale known as 'the dragon lady' by journalists in Saigon. She is described as being 'imperious and iron-willed,' 'a devious, chain-smoking intellectual with a low, rasping voice,' and 'molded into her . . . dress like a dagger in its sheath.' While she's acknowledged to be a serious threat to the United States, much focus is placed on insignificant details about her life. I found it unbelievable that the author of this article made constant reference to how dangerous she was, yet never bolstered these statements with any concrete fact. More time was devoted to her romanticized childhood and her couture clothing than her politics. It made me curious--was the lack of information because she was simply a woman and her dress was more interesting than her politics, or was there a lack of specific information about her involvement in the crimes being committed by the government?" So, yes, I've quoted myself here. This is from a paper I wrote in response to a Newsweek article entitled Getting to Know the Nhus from September 9, 1963. One of my favorite assignments in my Literature of the Vietnam War class was the personal reaction papers that sent us scurrying to the library and pulling the old bound periodicals from the shelves and reading articles from magazines like Time and Newsweek. Others would simply grab a book, photocopy the first Vietnam article they came to, and trot off to write their paper. Me? I spent hours flipping through the yellowed pages and photographs before I settled on one for my article. And that was how I first encountered the petite dynamo that was Madame Nhu. While she certainly piqued my curiosity, it quickly became obvious that learning about the real Madame Nhu was virtually impossible due to the obvious negative bias of the press, as well as Madame Nhu's own role in crafting her image. So when Monique Brinson Demery's book about her personal relationship with Madame Nhu was released, I was excited by the prospect of finally meeting the "real" Madame Nhu. And did I? Well, yes and no. This is not a criticism of the book, but rather a reflection of the fact that Madame Nhu was the product of endless contradictions. Born in another time, another culture, another economic class, she certainly could have been a shrewd and intelligent politician. However, her arrival as an unwanted and unloved middle daughter (her mother always suspected she had been "switched" with a common child while she was left in the care of her paternal grandmother) created a keen sense of inferiority that she railed against her entire life (a defiant streak nurtured by a fortune-teller's prediction that "Her star is unsurpassable" and that the young girl was destined for greatness). Her upper-class family had both royal and colonial ties, leaving her oblivious to her Marie Antoinette-like disconnect from the common people (even commenting that she would she would clap her hands as Buddhist monks "barbecued" themselves). Raised in a Buddhist and Confucian household, her later conversion to Catholicism was embraced with a zealot's fervor--and a hurried convert's misapplication of principles (her morality laws banning contraception, polygamy, dancing, gambling, and, of course, the evils of the underwire bra quickly turned her people against her, despite her belief that she was protecting women in particular with many of these edicts). It's no wonder that the girl who should have been a boy, the Vietnamese woman who couldn't understand the Vietnamese people, the Buddhist who became the dogmatic Catholic, the very embodiment of the collision of East and West, would become such a polarizing and often confusing historical figure. Demery embraces these contradictions and presents Madame Nhu as a flawed woman with extraordinary potential--a woman desperate to blaze her own trail, yet restricted by her time, her gender, and her own misconceptions about the world. Demery's portrait does not shy away from the vain, arrogant, and manipulative aspects of Madame Nhu's personality. Indeed, we see Madame Nhu baiting Demery with promises that she will release her memoirs to her, as well as controlling and dictating the terms of their relationship. Demery becomes exasperated with Madame Nhu's machinations, but holds out in the hope that their continued exchanges will reveal something genuine about the woman history has both fairly and unfairly maligned. And she succeeds in this. While Madame Nhu is never exonerated by Demery's story, Demery does succeed in creating some sympathy for a woman who, behind closed doors, was pained by the failure of her marriage, desperate for love and approval, and denied the ability to help her husband and her brother-in-law, President Diem, sidestep some of their more foolhardy missteps. Compelling and readable, Finding the Dragon Lady does not attempt to put Madame Nhu on a pedestal, but rather to dust away some of the misconceptions that have settled over the years on the legacy of the dragon lady.